This is a good craft project for groups that doesn’t cost very much to make, yet provides lots of creative fun for the youngsters. In art class, either for Halloween or for younger students to make as part of a human body study, Q-tip skeleton pictures offer lots of room for individuality. 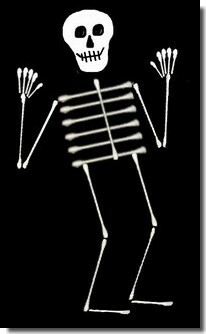 You’ll be surprised at how different each of these stick-figures can look, particularly when the kids try assorted poses before gluing down their skeletons. Tell the children to draw a few skeleton faces on white paper. Suggest that they begin with a peanut shape with a larger, rounded top and smaller rounded jaw. Inside this facial shape, they should draw eyes, a nose, and a row of skeletal teeth. The children should then cut out their favorite face and glue it near the top center of the black construction paper. Just below the face, the students should glue a row of six q-tips to the paper, to represent ribs. On top of the rib cage, they will need to position a single q-tip, which will serve as the back and neck bone. Just below each end of the last rib, glue two more q-tips to act as thigh bones. At the end of each thigh bone, glue a shin bone. Cut two q-tips to about two-thirds length, and glue in place as the skeleton’s feet. Attach a q-tip near the end of the top rib, to serve as the upper arm; repeat on the other side. At the end of these, place two more q-tips as forearms. Cut five q-tips in half, then snip a little more of each piece, to make fingers and thumbs. Glue five of these at the end of each arm as hands. Let the glue dry, then hang your skeletons for Halloween. SillyChely shared great video instructions for making cotton swab skeletons on YouTube. I particularly liked the Q-tip cat. I’ve embedded her tutorial here for your convenience.